It’s not been a great year for Duncan Jones so far. Aside from losing his father, the legendary David Bowie, to cancer back in January, the Moon and Source Code director has been trying to put the final touches on his biggest project to date, an adaptation of Blizzard Entertainment’s long-running high-fantasy video game series World of Warcraft, plied with the pressure from fans of both the games and the director’s past films to finally make a video game adaptation that is in any way better than most other video game adaptations. Sadly, it’s yet another blow for Jones’ less-than-stellar first half of 2016; Warcraft: The Beginning is certainly ambitious, but is so painfully dull and boring that those ambitions end up meaning naught. If you’re at all curious as to how they even managed to fit the expansive World of Warcraft universe into a single plot, here’s how it goes: a colony of Orcs arrive in the realm of Azeroth via a magic portal to escape their dying homeland, which doesn’t sit too well with the human occupants, and so the fight is on with both sides trying to find ways to bring peace for everyone to accept. 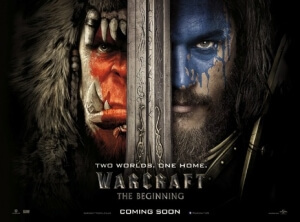 We focus in particular on two main leads from both sides; for the human Alliance, there’s Sir Anduin Lothar (Travis Fimmel) who teams up with a young mage (Ben Schnetzer) and a half-Orc slave-turned-warrior (Paula Patton) to put an end to the conflict; and for the Horde of Orcs, there’s clan chief Durotan (Toby Kebbell) who sees the destruction that the magic portal is bringing to the land and wishes to put a stop to it. Making a story out of something that had no concrete story to begin with is an extremely difficult task, so co-writers Jones and Charles Leavitt should be at least commended for completing an all-but-impossible challenge in the first place – but unfortunately, there’s little to no substance within their script that’s worth caring about at all. You find yourself invested in almost none of the characters, who have no defining or interesting characteristics whatsoever; the story, although once again remarkable for even existing around a property with no real story, is as generic and unengaging as any Tolkien knock-off; and even the visuals, as grand as they can be in their design, get very old after what feels like an eternity looking at them whether they’re used to create backgrounds or mythical creatures like enlarged flying griffins. You often find yourself checking out every now and then due to the sheer boredom you’re experiencing while watching it, and when you do focus your attention back on the screen you end up finding that nothing has been lost and it’s still just as dull as when you first starting zoning out. None of it is entertaining either, not even in the way that another bad game adaptation – Dungeons and Dragons – ended up being, albeit unintentionally. The tone throughout is deadly serious, like it’s trying to catch up with Lord of the Rings in terms of epic drama and stakes while sacrificing the simple charm and genuine weight that made those films the classics they are today; it’s very rare when someone attempts to bring humour into the situation, and even then it’s either underplayed or it just doesn’t fit within the overall humourless feel of it. You are sat there expecting to be fully on board with everything that is happening in the same way we were on board with Lord of the Rings or even The Hobbit because they’re saying and doing these very silly things with a straight face, but we’re not because the film never gives us a reason to care about anything or anyone, so we have no interest whether these characters make it out alive or not. There are, however, a few positives scattered across the mess. The motion-capture work on the Orcs, as well as their CG appearance, is genuinely impressive; half the time, even though we know it’s not the case, they look like they’re actually there, especially in close-ups which add textures and hidden features to their skin and facial features we never would have noticed otherwise; the designs of some of the landscapes, which do include some practical sets but ultimately favour CG backdrops, are creative and appropriately fitting for the fantasy world they have created; and for all we’ve said about the characters being extraordinarily uninteresting and dull, Kebbell’s Durotan is the only one in the film we actually come close to actually caring about, mostly because there are more scenes dedicated to him being a character than any of the other main characters, enough for us to at least root for this guy and be profoundly disappointed when his character gets a less-than-satisfying payoff. Other than that, there’s just nothing of true worth to be found in this film, which is a shame to say given how Jones and his team of thousands have spent nearly three years and much of its $160 million budget putting it all together, and based on some of the designs there were some genuinely talented people working on it. In the end, though, it’s just disappointingly bad, and not even the fun kind of bad, just the soul-crushingly lifeless kind of bad. Sorry Duncan, but Warcraft: The Beginning is another strike against your year so far. Warcraft: The Beginning is a disappointingly bad video game adaptation which, despite clear ambition and effort by director Duncan Jones, is so overwhelmingly dull and boring with hardly any characters worth caring about nor anything in its generic story to keep you invested at all throughout its eternal-feeling running time.